For maximum performance, ASKO offers a variety of knife grades, such as high temperature super alloy and hot work tool steel. For large special section hot cutting, we manufacture knives in composite super alloy designs. When it comes to cold work applications, ASKO knives are available in a wide range of grades and tailored to each application whether shock or wear is the source of knife edge ending. Additionally, we regrind and refurbish every type of bar, rod, section and wire knife. Knives and/or knife cassettes are processed at our facilities for expert reconditioning to original specifications. Our reconditioning programs are designed to support every mill operator’s demands. 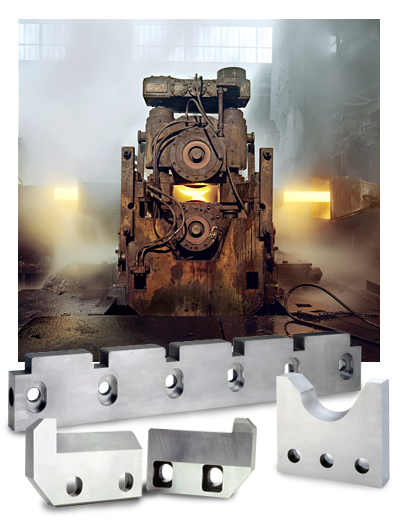 ASKO also offers Cast, Profile & Edger Rolls and Rolling Rings for Heavy Section, Medium Section, Rail, and Hot Strip Mills through its partner Coswig and Rail Mill Rolls through its partner Bowers & Jones Ltd.